At an event in Hyderabad, Xiaomi unveiled two smartphones in India- the Redmi 6A and the Redmi 6. The Redmi 6A is a direct successor to the Redmi 5A, which the brand sold over three million units in Q2 2018. The Redmi 6, on the other hand, succeeds the Redmi 5 which was launched back in March 2018. 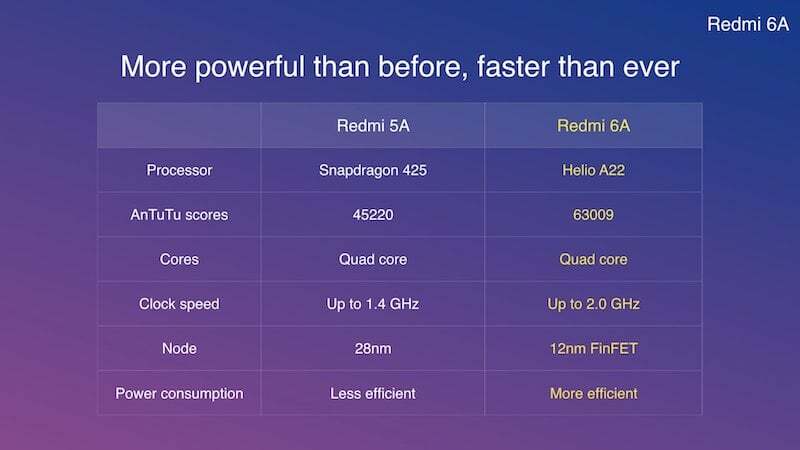 The Redmi 6A comes powered by the MediaTek Helio A22 chipset, while the Redmi 6 has the mid-range Helio P22 SoC on board. The Redmi 6 Pro, which was also unveiled alongside the Redmi 6A and Redmi 6 comes powered by the Qualcomm Snapdragon 625 chipset. The Xiaomi Redmi 6A comes as a successor to the Redmi 5A, which was the highest-selling Android smartphone globally in Q2 2018. The Redmi 6A sports a 5.45-inch HD+ display on the front with 18:9 aspect ratio. At the heart of the phone, it has the Helio A22 chipset which is an entry-level processor built on top of the 12nm manufacturing process, something which we haven’t seen on any other smartphone priced under Rs 7,000. It’s also the only smartphone to feature a clock speed of up to 2.0GHz. The Redmi 6A comes in two variants with 2GB of RAM and 16GB/32GB of internal storage. 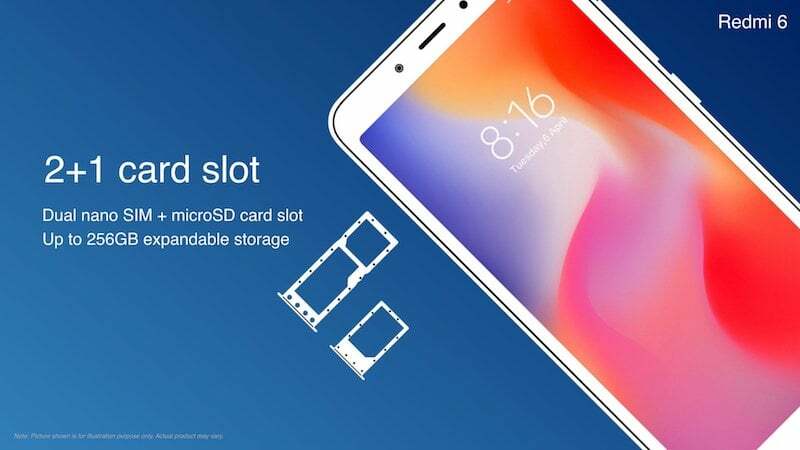 Xiaomi has added a dedicated microSD card slot for those who’re interested in expanding the storage. The Redmi 6A flaunts a single 13MP rear camera with PDAF, followed by a single 5MP front-facing camera. Surprisingly, the Redmi 6A comes with Electronic Image Stabilisation (EIS) for video recording. Connectivity options on the Redmi 6A include Dual 4G, VoLTE, Wi-Fi 802.11 b/g/n, Bluetooth, GPS and a Micro USB port. The device boots MIUI 9.6 out of the box, based on Android 8.1 Oreo. Lastly, the phone is backed by a 3000mAh battery. The Redmi 6A lacks a fingerprint scanner, same as the Redmi 5A, but it offers Face Unlock functionality. The Xiaomi Redmi 6 is a major upgrade to the Redmi 5- in terms of hardware and cameras. While the Redmi 5 arrived with a single camera, the Redmi 6 takes it to a whole new level by offering dual cameras on budget. Xiaomi has added a 12MP primary sensor on the rear side of the Redmi 6, which works with a 5MP depth sensor. The camera app offers various AI features including the Portrait mode. On the front side, the Redmi 6 has a 5MP shooter. 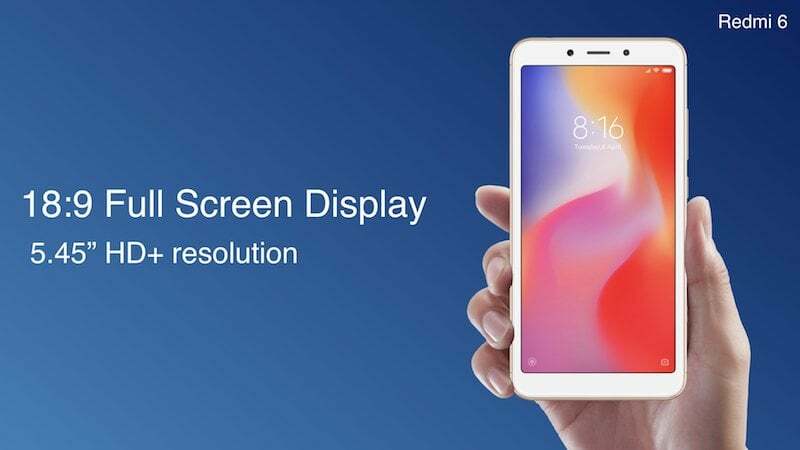 The Redmi 6 also comes with a 5.45-inch HD+ display with 18:9 aspect ratio, same as the Redmi 6A. Internally, it has the Helio P22 chipset, built on the 12nm process and comes in two variants- 3GB of RAM and 32GB/64GB of internal storage. Again, there’s a dedicated microSD card slot for storage expansion. This dual-SIM card smartphone comes with Dual 4G support, thanks to the Helio P22 chipset. This phone also runs MIUI 9.6 based on top of the Android 8.1 Oreo and comes armed with a 3000mAh battery. This device has a rear-mounted fingerprint scanner, and Xiaomi has added an AI-based Face Unlock functionality as well. The Xiaomi Redmi 6A comes in four colour options Black, Gold, Rose Gold and Blue. The 2GB RAM variant with 16GB of internal storage is priced at Rs 5,999, while the 2GB RAM variant with 32GB of onboard storage comes at a price of Rs 6,999. These are introductory prices for the next two months. The first sale will take place on Mi.com and Amazon India starting September 19. The Redmi 6 also comes in four colour options- Black, Gold, Blue and Rose Gold. This device comes in different configurations with 3GB/32GB of storage and 3GB/64GB of internal storage. The base variant is priced at Rs 7,999, while the 3GB/64GB variant retails for Rs 9,499. Both the smartphones are part of Xiaomi’s Make in India program. 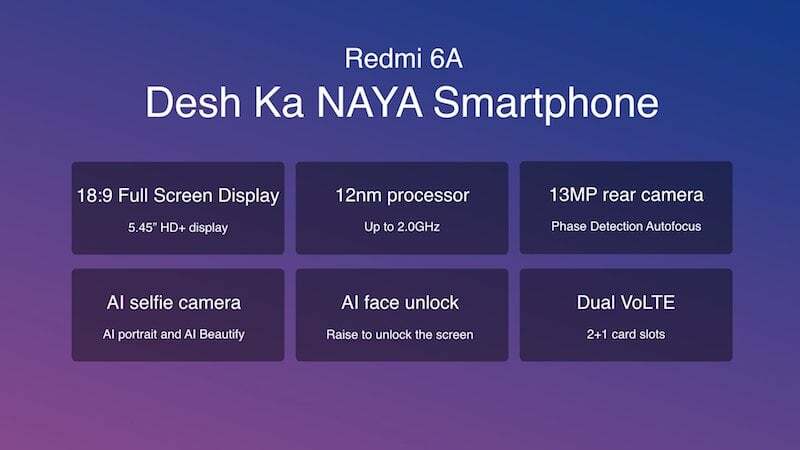 The first sale for the Redmi 6 on September 10 via Mi.com and Flipkart. During the first sale, the Redmi 6 is eligible for Rs 500 discount on HDFC debit/credit cards.